I have watched five Iranian films in the past thirty hours. And these are strictly Iranian films, as in not films in which an outsider narrates what “could have happened” in Iran. I have spent about eight hours, between 7pm Friday and right before midnight Saturday, watching films that are made in Iran. The five films in reference not only tell a story about Iran, but also, and more importantly, the films that I watched are exactly what is screened in Iran in cinemas, and they make sense to the average Iranian and are in fact produced to address them. In other words, “Ferrari” is not another “The Stoning of Soraya M”, and “Blockage” is categorically different from “Tehran Taboo”. And that makes the line-up of CineIran 2017 Festival even more valuable. In addition to “Ferrari” and “Blockage”, I also watched “Boarding Pass”, “Yellow”, and “Sara and Darya”. In short, the word “Million Tomans” appears to be a key component in every contemporary Iranian story. That is of course if “Billion Tomans” is not occupying the spotlight. 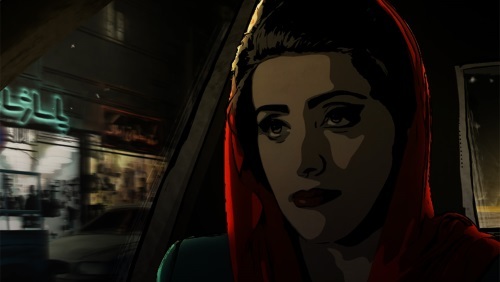 The girl in “Ferrari” has travelled from a village in the North to Tehran in search of a Ferrari that is owned by the rich and exuberant Sajjad. While she seems to be fascinated by the beauty of the Red Ferrari, she in fact repeatedly insists that the car is worth eight billion Tomans. The viewer is of course reminded that her subject of affection may in fact materialize in Sajjad, whom may actually be the physical manifestation of an intersubjective reality that is determined by the size of one’s bank account. In “Blockage” affection is towards the truck that the protagonist of the film is trying to obtain. Having had a history of drunk driving and while he does not even have the appropriate driver’s license for the truck, he has an earful for anyone slightly interested that the truck will provide for him and the love of his life an stable income that they have lacked during a decade of marriage. In his push towards getting his hands on the protection of metal against the brutality of life, the main character in “Blockage” risks everything and the viewer is left with the hope that he is salvaged through cashing in on someone else’s property. The sad part is that the spectator in fact sympathizes with the necessity of stealing from the invisible other in order to protect what is within one’s perimeter in contemporary Iran. “Boarding Pass” is an explicit dive into the core of desperation, wherein the female character of the film is turning paler by the minute as small packages in her stomach leak cocaine. 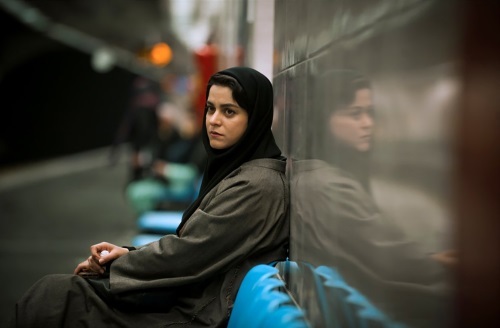 She is accompanied in her trip to death in the streets of Tehran by her male co-conspirator, where the duo watch videos of each other’s children and share personal stories. The protagonist of “Boarding Pass” dies on the seat of a modern bus during the dawn of a gray sun over cleanly washed streets of Tehran. If the female character of “Boarding Pass” had in fact chosen, under distress and with no other viable option, to utilize her body as her boarding pass to a better life in Turkey, the fate of the male character in “Yellow” is dictated by his liver, and of his bank account. After a severe complication, the man is dying in the hospital and the only available liver belongs to a brain-dead man whose son demands a hundred million Tomans for signing the papers that allow the transplantation. The money is eventually collected, for four million Tomans of which it is implied that the man’s wife provides sexual favors to a peeping neighbour, and for six million Tomans of which she calls on a rival lover of her husband and pretends to be his sister. Nevertheless, the transfer of the money does not result in the transfer of the liver. It turns out that the collector of the fortune cannot in fact legally authorize the extraction of the liver and the man in distress dies on his bed with a trace of his wife’s lipstick on his right cheek. Having watched four films, all of which in one way or another magnified the role of financial affluence, or in fact lack thereof, in the life of the average Iranian, it was not a surprise for me that “Sara and Darya” concerned debt accumulated by a son, who has since escaped the country, and his sister’s attempts to save herself and her mother from the creditors. Why is there so much sorrow in these five films? Why is everyone missing a few hundreds of millions of Tomans? Why is everyone under so much stress that when the film ends I am left with the guilty, yet happy, thought that I am in fact luckier and happier than a large number of Iranians in Iran? And maybe that is in fact the main point? One can trace the chaotic and abusive situation of contemporary Iran to either “The Mullahs” or western and foreign hostility and the sanctions. To my understanding, either argument holds a good amount of water. Independent of the culprit, or culprits, however, I am left with the thought that the current situation in Iran in fact conditions the inhabitants of that land with feelings of insecurity and a heightened sense of being in danger. This might in fact explain the Iranian psyche, not only within the geographical borders of Iran, but also at the diaspora, and more particularly in Toronto. Within this line of thinking, there should be no surprise that a first step for the Iranian petit bourgeois in Toronto is to obtain a heavy mortgage and to land on a house in the farthest outskirts of the GTA. The observation that the average Iranian is a real estate agent, unless she is not, is no inexplicable matter either. The average Iranian in Canada has experienced financial difficulty in the homeland and seeks some sense of security in a foreign land. In fact, her primary reason for taking upon herself the cumbersome path of immigrating to the other side of the planet might have been more economical than else. As a bookseller slash physician in “Boarding Pass” suggests in passing, one needs to have a functioning economy in order to elevate societal norms. Whether or not this statement is correct, many Iranian expats may have taken it at face value and might have made the most important decision in their life based on it. 1. In Canada, many people (not only Iranian immigrants) consider buying a place as part of establishing a family and having kids, especially if they have a secure job. So buying a place is “one of the norms” here too. 2. We should keep in mind that people get attracted to different social norms. Some people (including many Iranians) prefer to have no binding to a region by buying a place. Some people don’t like the idea of a bonding job, establishing a family, or having kids. People have different priorities. 3. You implicitly consider a value for being in city central areas, so you assume being away means a sacrifice. Many people (especially engineers) actually work on the “outskirts of the GTA”. 4. The golden year of the real state price rise in Toronto was very tempting for many people to get the easy money. If you can’t find a good job as an immigrant, this could be an accessible good job with a short rewarding turnover. And one more thing: You assume (maybe not explicitly mentioned in this post) that going under a heavy mortgage is keeping the “Iranian petit bourgeois” far from the border of cultural events, both physically and mentally. I think that typical “Iranian petit bourgeois” indeed does not care about those cultural events, with or without the purchased house. The evidence is that they still use the money to go to the Caribbean every year.